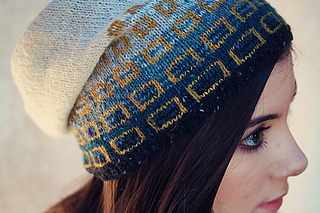 A slouchy beanie using subtle yarn changes to create an ombre effect, Starritt also features short row shaping to give extra drape. 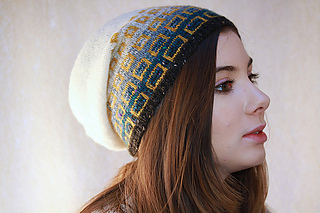 Stranded colourwork in a zingy contrast gives a modern geometric look. You will need less than one full skein of each colour A, B, C, D and F, and 2 skeins of E.
Sample shown uses Pendle (A), Nidd (B), Muker (C), Nappa (D), Bell Busk (E), and Leyburn (F).